Several quick blog posts today. I've been busy. I have a Homier 7x12 Mini-Lathe It's been out of commission since last year when I broke the belt while machining a base for a Van de Graaf generator. 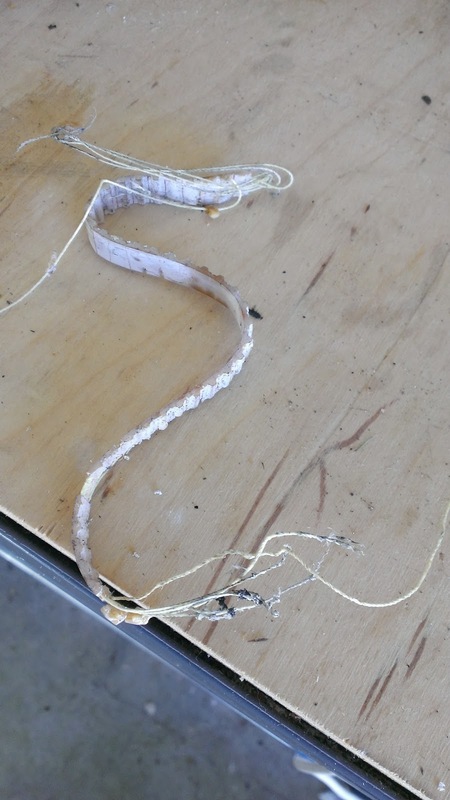 The old belt. Not so great. I ordered a replacement from LittleMachineShop.com along with a new chuck key and a set of 3/8" boring bars. I disassembled it with help from the instructions posted over at mini-lathe.com. It wasn't too bad. The gear cover, two of the change gears, and the back-gear assembly had to come off. Roughly 10 screws total. 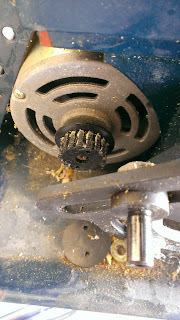 When I got it apart I found that the drive pulley was pretty chewed up. It looks like the old belt wasn't aligned properly from the factory so it slowly self-destructed while depositing melted nylon into the pulley. I scraped all of the yuck out that I could and slipped the new belt on. I also ended up pulling off the motor cover and control panel so I could adjust the motor now. I was able to straighten it out so that the belt tracks properly now. This belt should last a lot longer than the old one. I also cleaned up the lathe a lot. It developed some surface rust and a coating of garage muck at our old house, and now it's at least ok. Not great, but okay. Anyway, the lathe is fixed now. One step closer to making something awesome!